1d12 Days of Christmas, Day 5: Oliver Christmas, a.k.a. THE KRAMPUS! 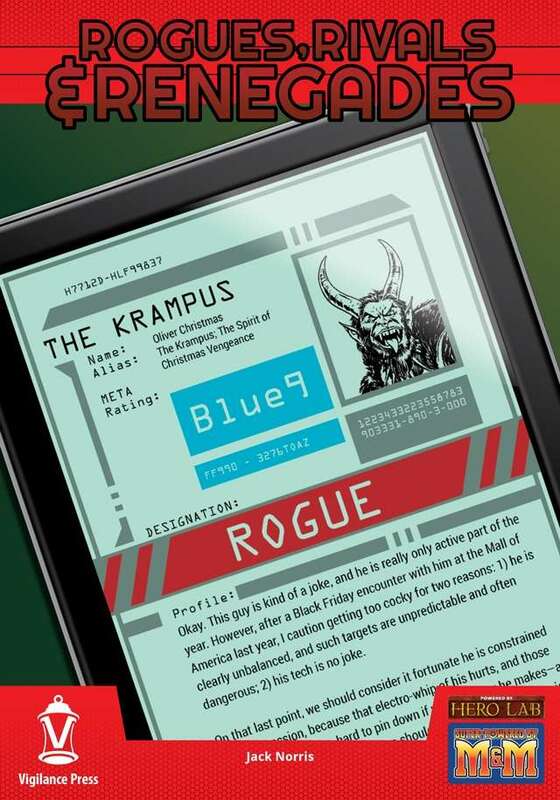 The Krampus is the first installment of Rogues, Rivals, & Renegades, a series of villain supplements for the Mutants & Masterminds 3E RPG. A devoted fan of the Christmas holiday, Oliver Christmas became mentally unhinged after a series of tragic events, and turned to a life of the vigilante. Now he vows to punish those who do not truly understand the real meaning of the holiday, using his Yule whip and other Christmas-themed weapons that he has engineered himself. This supplement includes the backstory and M&M stats for The Krampus, some great character art, and a printable mini.